A collection of fun Halloween cake decorations can turn a simple orange and black cake into a kooky culinary creation. From ghosts to ghouls to jack o'lanterns and creepy trees, making just about any kind of edible scene is possible with creativity and the right decorations. 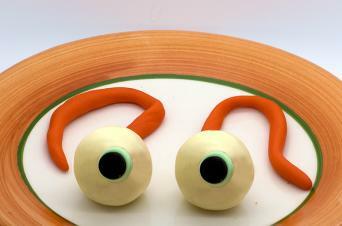 Eyeballs are some of the simplest and most fun decorations to make. They can add a touch of gruesome imagination and make the perfect addition to your Halloween cake design or zombie party confections. First, break off ping pong ball sized pieces of white fondant. Roll them between your hands or on a hard surface until they are smooth and rounded. Then use pre-tinted fondant to add a small circle of color in the center of the eye. Bright zombie green or eerie red can be a lot of fun. Add black pupils of black fondant in the center of the colored circles. Next, roll several skinny pink or red fondant ropes. Secure the ropes to the back of each eyeball. 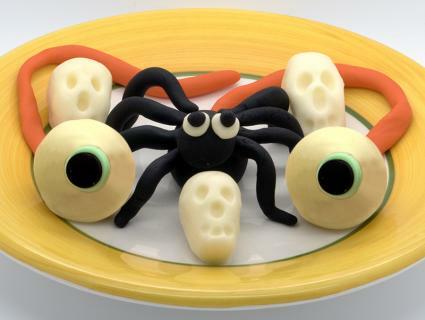 Pipe on spiders with black buttercream or make them with fondant and candies. Then situate them in a web of royal icing or even a cotton candy nest stretched across your cake. 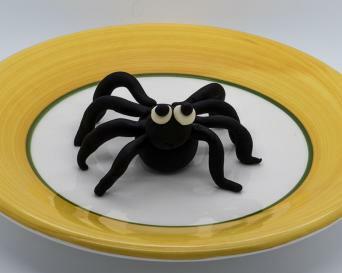 Roll a small piece of black fondant into a ball to form the spider's body. Break off eight small, equal-sized pieces of pull-and-peel black licorice. Secure them all around the spider's body with dabs of black buttercream. Alternately, roll more black fondant into small, narrow ropes, break the ropes into pieces, and use the pieces as spider legs. Using a number 4 piping tip and black or brown frosting, pipe a thick ball of icing on your cake. Just above the first section of your spider, add another smaller, rounded bead for the head. With a small writing tip, number 2 or 3, pipe four legs on either side of the spider body. Skull decorations can be flat or three-dimensional. If you use inedible decorations or let your fondant dry before placing it on cakes, you can reuse the skulls for Day of the Dead confections as well. 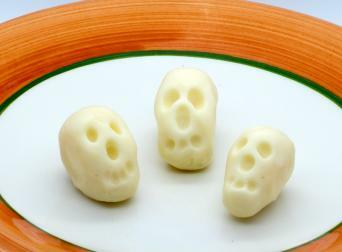 To make a 3-D skull decoration, start with a rounded ball of white fondant that is rolled smooth. Slightly elongate the ball of white fondant to give it more ovular appearance. Mold the fondant using your fingers or utensils to make indentions for the eyes, nose, and mouth. Roll out black fondant and cut small facial accents from it to press into eye and nose cavities to add dimension to your skull. For an added bit of ghoulishness, detail the skull with "blood" by tinting clear piping gel red with food coloring and applying tiny drips around the eyes or mouth. 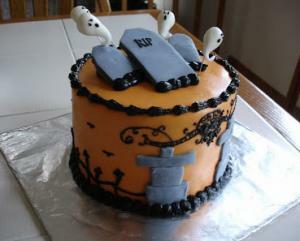 Ghosts make great additions to graveyard cakes. They can be created with simple fondant techniques or with a piping bag of buttercream in a color of your choice. Roll out a grape sized ball of white fondant until it is smooth on all sides. Gently roll one end of the fondant against a flat surface to make it narrow into a smaller point like a tail. Add tiny dabs of black buttercream to create the eyes. Make the ghosts stand up by securing them to a cake or cupcake with a toothpick stuck through the bottom. Using a piping bag affixed with an open tip number 4 or 5, pipe a wavy, rounded figure on your cake. Be sure to bring the icing down to a point to create a tail-like appearance. Use black buttercream to create rounded, dark eyes and a mouth of your choice. If there is one icon that represents Halloween it is the jack o'lantern. Creating pumpkins with silly faces can be a lot of fun, whether you are using buttercream, fondant, or any other method you choose. 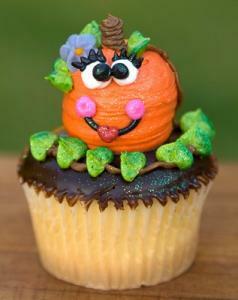 These little orange creations can be plopped on haunted cakes or piped on a cupcake. Roll a ball of orange fondant the size of your choice until it is rounded and smooth. Use a knife or edged fondant tool to press creases around the pumpkin vertically to create a sectioned look. Add a stem with a small piece of brown fondant or black licorice at the top. Use yellow fondant rolled thin, to cut out triangular shapes for the eyes, nose, and mouth. Use a tip number 4 or 5 to create a rounded ball of icing. Use a tip 2 to create a small stem. Create a face for your pumpkin using small writing tips number 1 or 2 and either buttercream or royal icing in colors that you prefer. Do not be afraid to veer away from the triangle eyes and nose. Use your imagination to create fun and silly jack o'lanterns. 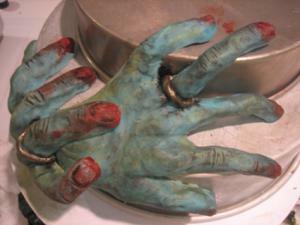 While complete zombies may seem like a lot of work, creating zombie fingers can be simple. Modeling chocolate makes a good material for fingers because of its skin-like finish. It is much less pliable than fondant once shaped, which gives it the ability to be molded with ease and maintain its shape when the design is complete. Use your own hand as a guide for measurements. Roll out five pieces of green-tinted modeling chocolate into cylindrical shapes. With toothpicks or a knife, create wrinkles in the finger around the knuckles and to carve out fingernails. Bend the fingers into the desired position. Arrange your zombie fingers on the cake or situate them as if they are reaching through the cake. Use red tinted piping gel for bloody accents. There is no better way to add some creepy fun to a cake than with a witch's head. 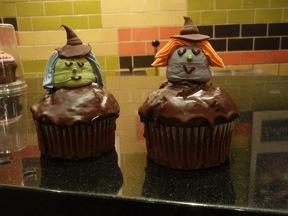 Using marshmallows and buttercream frosting, you can create simple witch heads on your Halloween cake or cupcakes. Use green food coloring to tint the surface of a large marshmallow. Situate the marshmallow on the cake upright, stabilizing it with a dab of buttercream frosting. With a tip number 233, pipe black or gray hair on your witch's head. Add facial features with tip number 2 and black icing. Create a witch's hat with fondant rolled into a conical shape with a flat base at the bottom. One of the best things about Halloween is how much it encourages self-expression and creativity. If the above ideas don't fit what you have in mind, brainstorm some of your own. Decorating is always more fun with others, so get kids and friends involved for a truly spook-tacular experience.